I have security implemented on a document I have created. I have set a password and would like to manage what users can and cannot do with the document. You want to manage what users can and cannot do to the document you have sent them. In PDF-XChange Editor, there are two separate password fields. These two MUST be different. The first password is for opening of the document, and that is the one that the author would send to general users. The second password is to set the permissions, and you will need to know this one to be able to change the document or to remove security from the document. This would be the "master password" so to speak. 2. Click Document Properties. The Document Properties dialog box will open. Use the Compatibility menu to select the document security compatibility. Use the Components dropdown menu to determine that components of the document to be encrypted. Select the Require a password to open the document box to set a password for opening the document. Enter the password in the Document Open Password text box and confirm it in the text box below. 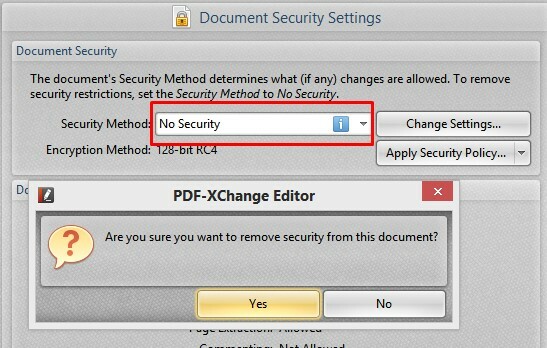 Select the Require a password to change permissions box for the document to set a password for editing and printing the document. Enter the password in the Change Permissions Password text box and confirm it in the text box below. Use the dropdown menus in the lower section to select permitted printing and editing options. Select/clear the options for textual elements as desired. Click OK to confirm and save changes. See bottom or article for instructions on how to remove security. In PDF-XChange Editor, you can set two passwords. One is required to open the document for viewing purposes, the other is set to restrict what can be done to the document. These passwords can be used together or independently. The default preferences should be set to not allow users to do anything but read the document. Setting printing permissions to either High Resolution or Low Resolution will set the program to not prompt for a password while printing. Functions that are specified to not be allowed will not prompt for a password, they will simply be greyed out and unusable. Please note that knowledge of all passwords attached to the document is required to remove security. You will be prompted to type the aforementioned "master" password, e.g. the one used to manage permissions for making changes to the document. If permissions editing has not been restricted you should not need to type a password at all. If you are prompted simply type in the password used to open the document. Please note that support provided by Tracker Software regarding security issues is very limited. Make sure to remember your password(s).